Struggling with a new story idea? Can’t get over your writer’s block? Time to get down to business—and pop open a beer. No, it’s not time to take a break. And it’s not too good to be true. Drinking beer is the delicious solution to tap into your creativity and produce big ideas. Not convinced? Then take it from a recent study that asked a group of 18 advertising creative professionals to put their brains (and beers) to work. These professionals were split into two teams, both even in level of experience and talent. While one team was asked to stay sober, the other team was allowed to drink as much alcohol as they wanted. The challenge for both groups was to generate as many ideas for a creative brief. Top creative directors judged the results. So who came out on top? Not only did the team of drinkers present more ideas, but they also contributed four of the top five best ideas. Science backs me up. Big ideas come from drinking a beer (or two). 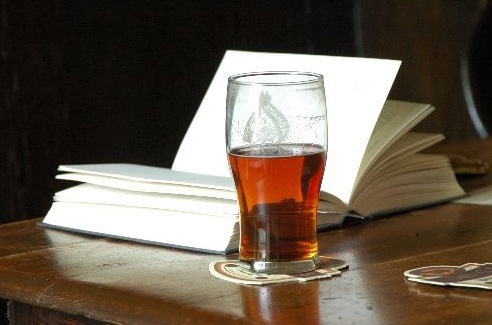 Drinking beer helps decrease your working memory. This is why you feel relaxed and less worried about what’s going on around you. With less focus on distractions, you have more brainpower dedicated to making those creative connections. Have you heard of the “eureka moment”? According to neuroscientists, moments of insight—the “eureka moment”—comes when you feel relaxed. Relaxation lets the front brain make connections with the back of the brain. The result: activation of your anterior superior temporal gyrus. In other words, that small spot above your right ear. That’s the spot in charge of generating moments of insight. Seconds before the “eureka moment,” a large increase in alpha waves occurs within your brain, activating the anterior superior temporal gyrus. These waves are associated with relaxation. Ever wonder why your best ideas happen in the shower or while on a walk? That’s why. Thought of that big idea? Congrats! Now put your pen down. Your big idea is awesome, but wait until your beer buzz fades. Stick to drinking a cup of coffee when writing your big idea. That way you have the focus to give full value to your big idea. And yes, there’s science behind that too. Has beer led to your latest big idea? Share your experience below.